Our Country Cottage, a Narrative, podcast is intended to be for those that want to, are in the process of, or have already realized their dream of building a retreat or retirement place in the woods. I will be sharing what I have learned from all phases of our project, from planning to enjoying and coming to terms with our cottage in the country. Hi, I'm John, and welcome to Our Country Cottage a Narrative, Episode #28. In this episode I will get you more up to date with the goings on at OCC and an OCC Year In Review, remembering some of what happened last year. So on with Episode 28 OCC update. As usual I left the last episode with some unanswered questions. Once again our trusty generator was not so trusty, refusing to start. Three days before my next visit we had a major snow dump in the city. I think I shoveled the walk 3 maybe 4 times that day. It just kept coming. The next day, taking my life into my own hands, and on summer tires, I ventured out onto snow clogged streets in an attempt to get a new battery for the generator. Two positive things were in play, 1- the generator supplier had just got a new shipment of batteries and 2- they had moved closer to where I lived in the city. Even though they were closer it was a sketchy trip but a new battery was acquired. Giving a couple of days for them to get the roads cleared, up by OCC, I loaded up our vehicle with all the snow emergency stuff I had, traction mats, shovels, tow ropes, come-along, kitty litter, snow shoes and on and on.. and off I went. Oh yeah, I had the new generator battery too. As I got closer to Our Country Cottage it became clear there wasn’t anywhere near the amount of snow we had got in the city. I didn’t need any of the emergency stuff I had packed at all. Sort of like when you carry an umbrella it doesn’t rain. But better to have it and not need it than, need it and not have it. Arriving at OCC I didn’t even need to clear the drive, just drove straight in. On my last visit I had turned the boiler off so the batteries would not be drained. With the days getting shorter, not much sun, and that pesky gen not starting I though it was the prudent thing to do. I hadn’t accounted for the sudden season change we just had. Now, with winter coming early in the city and temps dropping all over I was genuinely concerned that OCC might have frozen. A quick check inside OCC revealed the batteries fully charged and no frozen toilets. The living room was at 12 C just on the power of the sun. I turned the boiler on. Outside I checked to see if the gen would start. Nope, it had not magically fixed itself while I was away. A quick battery swap and she fired to life with little effort. The solar control panel showed the gen charging at 5.2 KW but with no load at all and the inverter light was off. I guess with the OCC batteries fully charged the gen was just supplying power to the boiler, etc. Hadn’t seen that mode before. After about ten minutes or so, I put the gen into Auto at the generator and it stopped right away. Then, at the solar control panel, I pressed manual start and the gen started right up, so I put it in Auto and the solar control unit shut it down with the usual cool down routine. And with no internal fan fail errors, all seemed to be working normally. Snow tires were put on the vehicle ready for the next big snow dump here, or in the city. Before I left I checked that the boiler was heating where it was supposed to be heating and, again, all looked normal. I took the opportunity to drop the defective battery off at the generator supply shop on the way home. It might still be under warranty. Rrright. Two weeks pass and I am back to check on things. What little snow there was, was just about gone. Good thing I had the snow tires on. Looks like the generator had run a couple of times since my last visit. A good sign. The propane was just under a half. It was over a month till my next visit, this time with my main country vehicle and its newly rebuilt heart. It now ran smooth and quiet. The main reason for the rebuild was a tick/ knock that had developed over the years, sometimes being so loud you could not hold a conversation by it while it was running. It was to the point that I was expecting something to come flying through the hood whilst on route to or from OCC. It was all good now. After having received an invoice for propane, earlier in the week, I checked the tank gauge to make sure it was my tank they had filled and sure enough it was up to 80%. 80% is the max you are allowed to put in these propane tanks. It allows for expansion etc as the outside temperature changes. I had brought with me some driveway markers that I found on sale and I devised a tool from a cast-iron pipe, a cap and a piece of felt, to drive them into the ground. I was going to place them around the turning circle and at the edge of the drive where I slipped off with the vehicle or tractor before. Yeah, well just a bit late. The ground was frozen. I tried one and it stands as a crocked testament, on the far side of the turning circle, that time and frozen ground wait for no man. Next season. The OCC batteries got topped up and data logs and solar control logs were taken. A trail cam SD card was also swapped out. Mental note. Need more distilled water. When I left the batteries were fully charged. Over the next week I was contemplating the pending shorter days and colder weather conditions. I had not improved our generators living conditions, IE I had not built it any sort of enclosure to help ward off the cold. I kept thinking of last years gen failures to start due to extreme cold. I think I have mentioned once or twice, how fast this summer seemed to pass. One minute I am mowing grass and putting tasty weed killing salt and vinegar on the vegetation and the next minute up to my boots in snow, not being able to drive a thin road marker into the frozen ground. A decision was made and seven days from my last visit I am at Our Country Cottage to basically shut her down for the season. I will still have to go up every so often to top up batteries, check data logs etc, but the terror of the frozen toilets and drained OCC batteries with its, “Power Has Been Lost”, emails will be abated. The biggest part to shutting Our Country Cottage down for the season is draining the water out of the place. First let me explain that I had picked up a couple containers of RV antifreeze, when they came on sale, a month or so ago and have been waiting, in the utility room, to be pressed into service since then. I started by draining the pressure tank then worked from the highest elevation down. So with the well pump off and the pressure tank draining into the sump, I started with the upstairs bathroom by opening all taps. You can hear the water getting sucked out of the pipe by gravity. I then turned off the water feed to the toilet and flushed it I then filled the tank with antifreeze and flushed again. This replaces all the water in the toilet workings with antifreeze. I pour a bit of antifreeze in the sink, tub and shower drain to replace the water in the traps. Downstairs, I do the same in the downstairs bathroom. I also turn the tap on in the kitchen sink and put some antifreeze down that drain too. Our washer dryer machine has a small lint trap that also has to be drained. And lastly the outside tap gets opened. A bit of an experiment this time. I didn’t drain the domestic hot water tank or the pre-heater tank, heated by the solar collectors on the roof. I figured that they were below ground, in the utility room and therefore should not freeze. I am also leaving the solar collectors running to heat that little radiator in the back hall. I had inadvertently turned them off last year when I shut the boiler and the thermostat, not realizing they were on the same breaker. Live and learn. Again as an experiment I decided to leave the boiler on and turn the thermostat off for the living room. The thermostats for the bathrooms were left on. I hope to see a big reduction in energy usage. Last year I was trying to keep the temp above freezing in the cottage for the winter but the gen failed and I shut the boiler off. This year I am trying to limit the heat in OCC so that the generator would run less while keeping it online. Give it a shot, anyways. I collected all liquids and took them back to the city. My next visit was three weeks later. The batteries were at 90% and the living room was at 10C. Just a bit above where it would have been if I had the heat on. The bathrooms were at the thermostat setting temperature. Good stuff. The generator had run just over fifty hours since my last visit. Now normally that would be a good sign. From previous years anything under 100 hours a month, this time of year would be great. But this year the weather had been particularly mild, so I am not sure whether I am winning or loosing. The only thing I can say is that I am glad I have collected all the data I have over the years. Stuff like generator hours run, data loggers, gen logs etc along with the notes I make for each trip. It might seem useless at the get go but it gives me lots of info to go over to see if OCC is on track or not. Well at least it does most of the time. When you have a year that is warmer, in this case, than the norm it kinda makes you think a bit more. I changed the oil and filter in the generator, back bladed about a third of the drive, more for me than the drive, and collected the solar control log and the generator log. When I left the batteries were fully charged. I had been driving for about fifteen minutes when I got the feeling that I hadn’t put the generator back into auto after changing the oil etc. And, no, I hadn’t taken a picture. It was too risky to leave it in manual as the gen would not be able to start if it needed to and the batteries would drain and I would get a terrifying “Power Has Been Lost” email. I turned around and went back. Sure enough it was in Auto. So it would have been fine. I took a pic. As it turned out that was the last visit of the year and a good place to conclude this episodes OCC update. A lot of things can happen in a year. Good and bad. A lot can also get forgotten. So this is my attempt at collecting all of the highlights and lowlights in this episodes OCC YIR. Info collected from over 60 pages of notes, hundreds of pictures and revisiting previous OCC podcasts, distilled into YIR. The year actually started with OCC sending my power lost emails. Very cold temperature had caused the gen to fail then the heating system started acting funny. Heating areas that shouldn’t be heated and not heating areas that should. So that’s how it started. The first solo overnight stay (2 nights) by my partner And 4 overnight (3- 2 night and 1- 1 night) stay while I wasn’t there. And one unexpected, furry, overnight guest in the garage. I went off the drive, getting stuck, half a dozen times, about 50/50 between my vehicle and the tractor, one time both on the same day. I almost went off the road several times. That included, heading toward the ditch and the wheels just catching at the last moment, and heading to the ditch and managing to stop just in time and backing away slowly. I had to snow shoe in once, almost walking off the road because the lighting was so flat I couldn’t see where the edge of the drive was. And I fell a few times but my standing up procedure, in snow shoes, improved greatly. The batteries were topped with distilled water 8 times. Trail cams collected 17 times. Solar control records collected 17 times Temperature data loggers collected 6 times Generator logs collected 6 times The generator oil and filter and the house water filter were both changed 3 times. Weed killer strategy was changed after finding out how bad the commercial weed killer was. The homemade stuff turned out to be not as effective as I had hoped. Something to work on. The solar equipment had its fan problem, but was easy to fix once it failed for good. I still get corrupt files from the controller from time to time. Not a big concern. A section of the loft deck railing, failed and was fixed. This gave us the incentive to check the rest of the railings, which exposed several other places that were missing a screw or two. The tractor mower grass chute duck tape repaired for less than a tenth of the cost of a new one. The generator gave me some problems, not starting when it should and starting when it shouldn’t. The heating system had issues as noted above along with the hot water not being so hot. A new BBQ assembled and working but not without issues. The old BBQ recycled. Some good meals were BBQ’ed after all. The Quonset got its skirt flap covered with gravel after being held down with only snow for several months. I had some very relaxing moments, too. Waiting for the six o’clock fox to show up, Casually looking out the window and seeing deer elk and moose, etc. Just being able to take wildlife pics from the living room couch is so cool. Listen to some good music with some good adult beverage while watching the trees in the valley. Gazing at the stars slowly revealing themselves in the sky as the sun set. Then there was the time I captured a solar eclipse with my camera, indirectly, from a quickly improvised pinhole projector. Well those are most of the highs and lows of last year. Nothing major. Our Country Cottage present a completely different set of challenges than I encounter in the city. As they say, a change is as good as a rest. For more details check out episodes # 23 – 27. Gad, I averaged less than 1 podcast a month. When I started I thought I would be able to do at least 2 a month. 2-Pull the shoulder of the driveway back up. These two things, alone, would help with two big issues, the generator reliability and sliding off the driveway, getting stuck. At the moment I am not sure how to do either but I will give it a good try this summer. Then there is that weed thing, that trap door thing, that other thing etc etc etc. So that’s Our Country Cottage, Year In Review done and dusted. For those of you that check out our website, there are some changes coming. The foundation that it was built on has changed, so, the site will change as well. I will attempt to do this in the next week or so. Dare I say that this might include new pictures, no I better not. Tune in next time for episode #29 and another OCC update. How is the new year treating OCC so far well at least the days are getting longer. 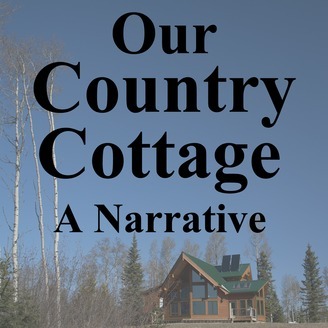 If you have any comments, questions or if you would like to be added to the “Friends of OCCaN” Our Country Cottage a Narrative, mailing list, you can email me at John@ourcountrycottageanarrative.com. Members on the mailing list will get website and podcast updates as soon as I do :). If you are on the “Friends of OCCaN” mailing list and had enough, just send me an email at John@ourcountrycottageanarrative.com and you will be released. 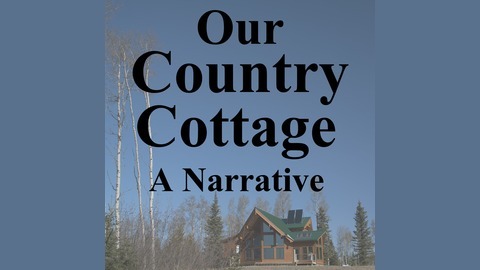 The Our Country Cottage a Narrative podcast is on iTunes, Apple Podcasts, Stitcher and Google Play so you can subscribe there and get the podcast downloaded automatically when they get released.